Pablo Cohen graduated from Temple University with a Doctor in Musical Arts degree. He has received numerous prizes and awards for his performances in national and international competitions. More recently he received the Music Teachers National Association Award for his outstanding teaching. 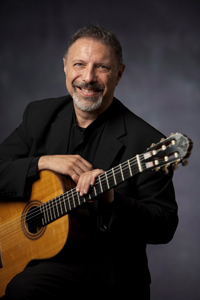 Dr Cohen is the head of the classical guitar program at Ithaca College and an affiliated artist at Cornell University. These are the words that Les Cahiers de la Guitare used to describe the playing of Pablo Cohen upon his debut recital at the Salle Cortot in Paris. “Fluid and delicate shape” wrote the Philadelphia Inquirer in reviewing his rendering of Giuliani’s Concerto for guitar and strings with Concerto Soloists Chamber Orchestra of Philadelphia. At his debut at the Ho-Am Hall for Performing Arts in Seoul in 1990, the Korea Times praised him as "One of the foremost South-American guitarists." More recently, he had the distinction of recording the premier of Carlos Guastavino’s Jeromita Linares with Camerata Bariloche Chamber Orchestra of Argentina for Dorian Records. Gramophone gave it "a cordial recommendation: outstandingly fine playing of a repertoire few of us know." His transcriptions of Chick Corea’s Children Songs along with his unveiling of solo and ensemble music by Latin American masters such as Radamés Gnattali, Horacio Salgán, and Carlos Guastavino represent an exciting new direction for classical guitar today. Pablo Cohen is an active chamber musician as well. In addition to the more traditional ensembles, he has participated in groups including duets with bandoneonist Daniel Binelli, marimba player Gordon Stout, soprano saxophonist Steve Mauk, and jazz guitarist Steve Brown. Recent engagements have included performances as featured soloist with the Concerto Soloists Chamber Orchestra of Philadelphia, Ithaca College Chamber Orchestra, Mansfield University Chamber Orchestra, a guest appearance at the 92nd street Y with the Young People’s Choir of NYC, performances for chamber music series with Ensemble X, the Cayuga Chamber Orchestra and with the Pro Musica Ensemble. He was also featured in two Latin American concerti with the Orchestra of the Finger Lakes at the Clemmens Center, NY. Mr. Cohen recorded “Concierto Barroco” by Roberto Sierra with the Sinfonieta de Puerto Rico, and recorded the CD “Cantan” with the Ithaca College Women Chorale, featuring the music of Dominican composer Francisco Nunez. In 2010 he is releasing the solo album “La Casa” with his transcriptions for guitar of music by Carlos Guastavino and Horacio Salgán, and in January 2011 is planning a recording with the Cayuga Chamber Orchestra of guitar concerti with premieres from Brazil and Argentina. Just recently, Mr. Cohen was featured on National Public Radio and on television for the Public Broadcasting System.